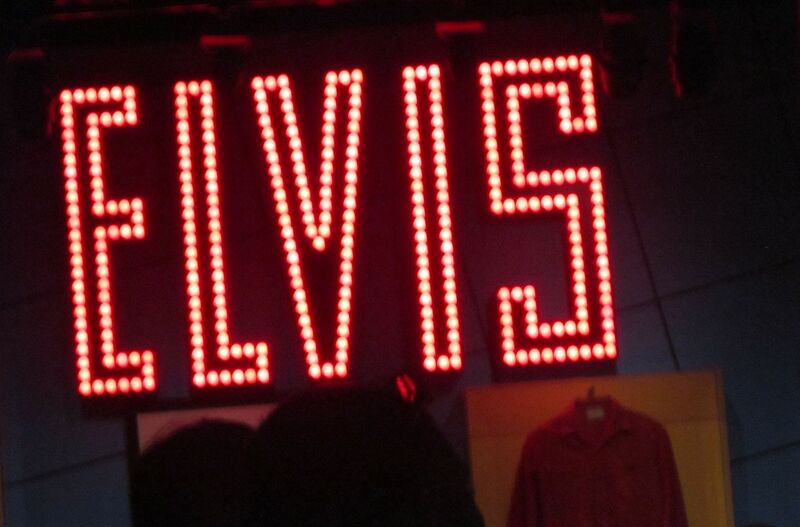 2013 Road Trip Photos #29: Rock ‘n’ Roll, Never Forgotten « Midlife Crisis Crossover! 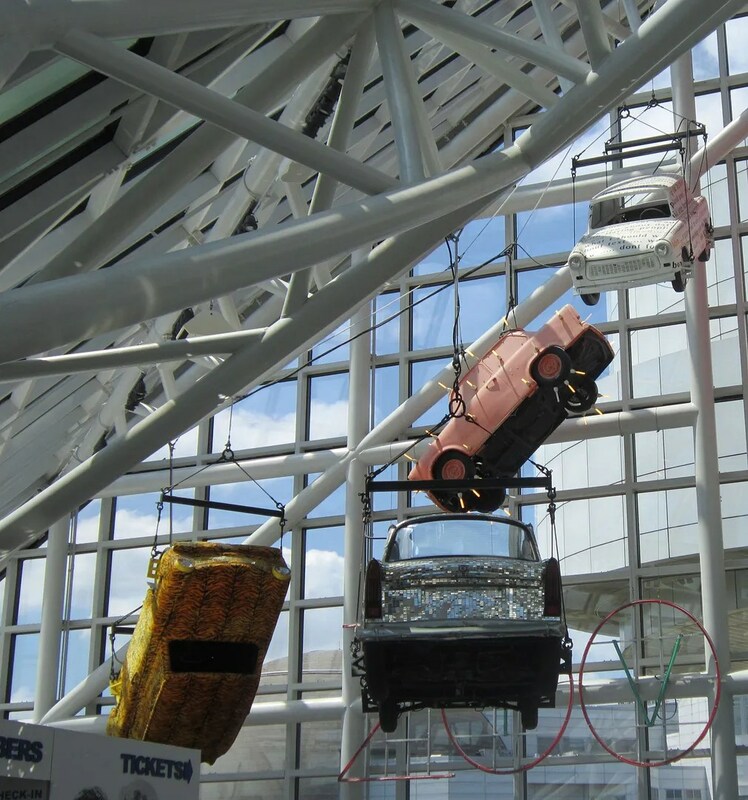 Previously on Midlife Crisis Crossover: pics from our visit to the Rock ‘n’ Roll Hall of Fame Museum in scenic, underrated Cleveland. Last time I shared the items and exhibits that struck the deepest chords for me. 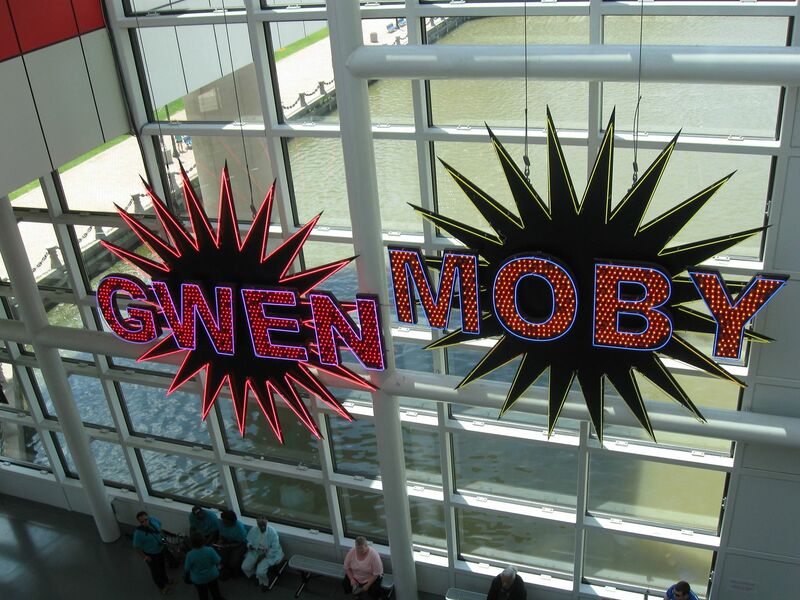 This time: the general-audience objects that also caught our attention. For example: FLYING DEATH CARS FROM ABOVE! Stage props from U2’s ’92-’93 Zoo TV tour. 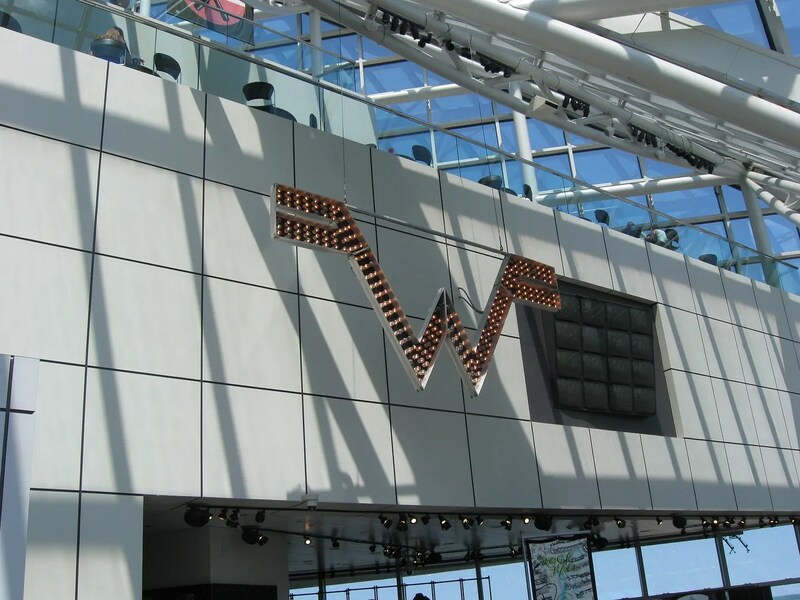 Hovering above the gift shop: the Weezer logo, another tour prop. Meanwhile down below, I picked up a souvenir shirt and a CD copy of Wave of Mutilation: Best of the Pixies. I’m pleased to report their record shop’s selection was better than the average Best Buy dwindling CD section. Plenty of vinyl, too. Family members who can’t keep up with their starry-eyed youngsters are free to kick back and relax by the shore of Lake Erie while the neon signs from Moby’s “Southside” video loom over them. I imagine the Day-Glo colors keep older visitors from falling asleep and missing out on all the rock. The entrance to the Hall of Fame proper is on an upper level. 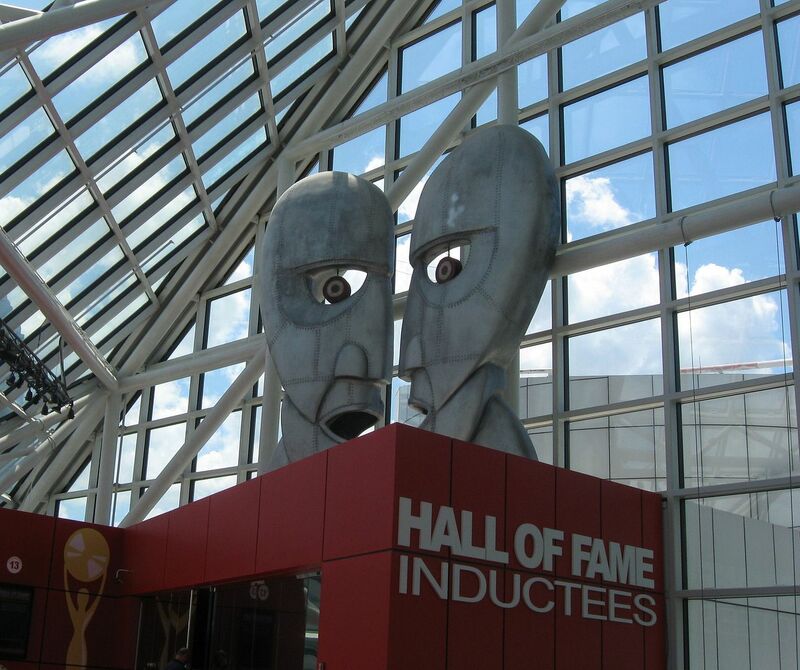 Standing guard above its entrance are the twin metalhead sculptures that were photographed for the cover of Pink Floyd’s ’94 album The Division Bell. Inside the Hall is a theater showing Hall of Fame Induction Ceremony highlights. Alas, the seats were packed and had a long line during our entire visit. 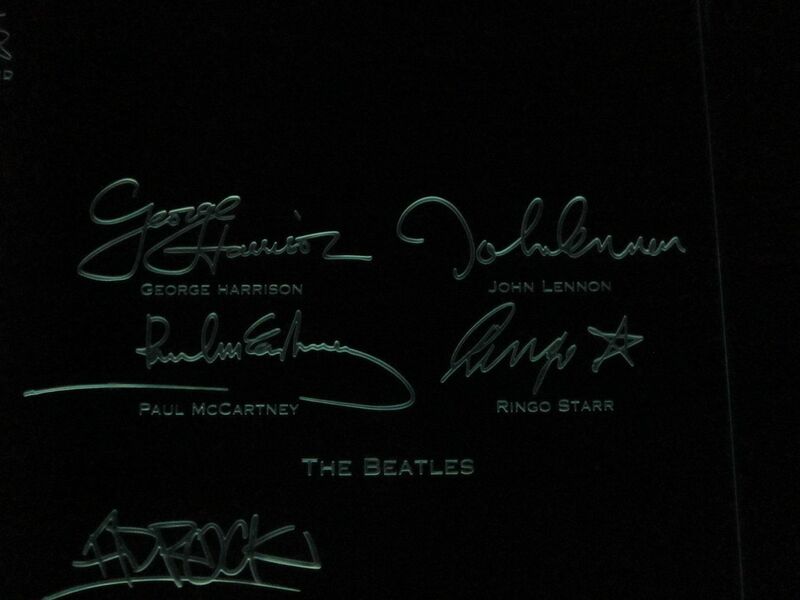 Along one side is a darkened hallway with one wall containing glow-in-the-dark replica signatures of all major inductees. You may recognize the works of this fabulous foursome, but my attention’s drawn more toward the lower-left photobombing by the sig of King Ad-Rock from the Beastie Boys. If the Beatles aren’t your thing, and you consider someone else the King of [insert broad genre here], other displays await you. Items from the life of this humble Southern boy, for one. No? Not that guy? 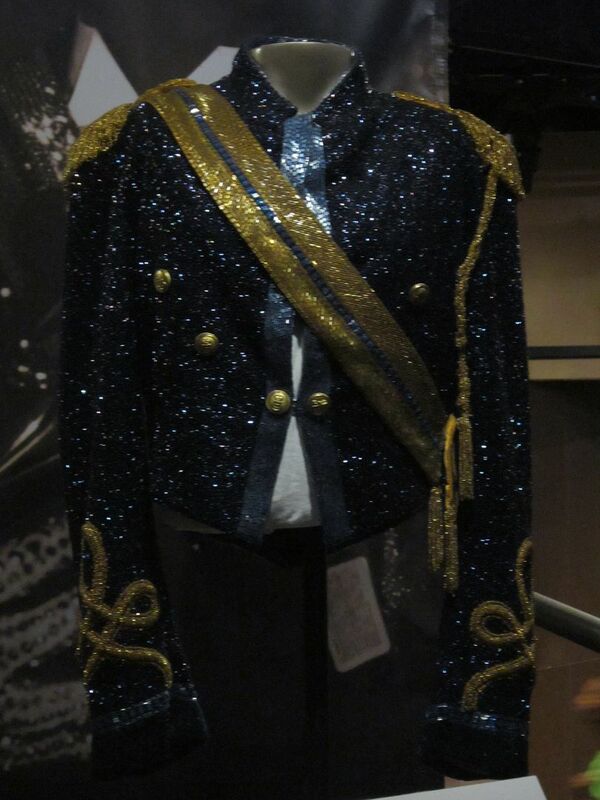 Then how about remembrances of the modestly dressed Michael Jackson? I hear sequins trump neon in some fashion circles anyway. You say you prefer something a little more historical, biographical, and impossible to wrap your head around? 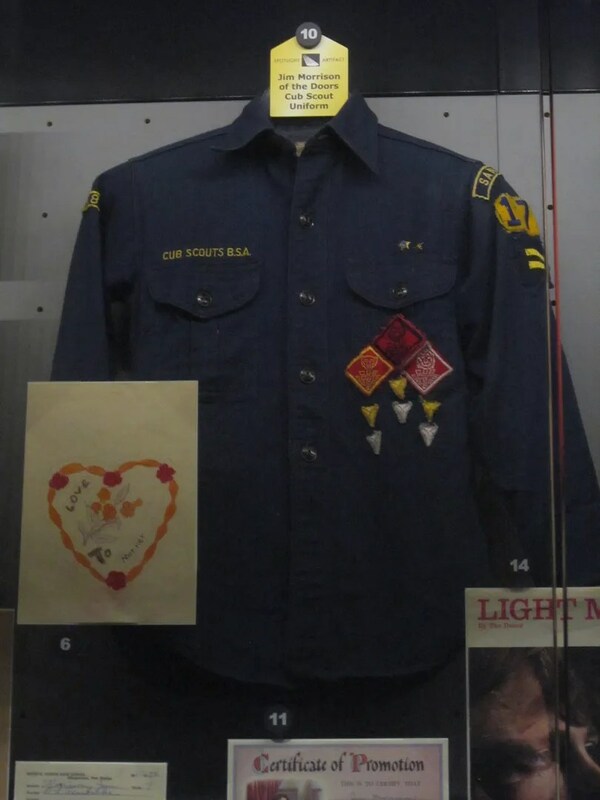 How about Jim Morrison’s old Cub Scout uniform? Just imagine how different life might have turned out if only he’d stuck with it, maybe even ascended to the rank of troop leader. Ah, what might have been. Or if you’d rather return to the land of theatricality and pizzazz, you can’t go wrong with ZZ Top’s incandescent-green guitars and fuzzy drums. The ’80s were fun times for custom instrument designers. Sometimes establishing your stage presence isn’t about color or frippery. Sometimes it’s just about power. 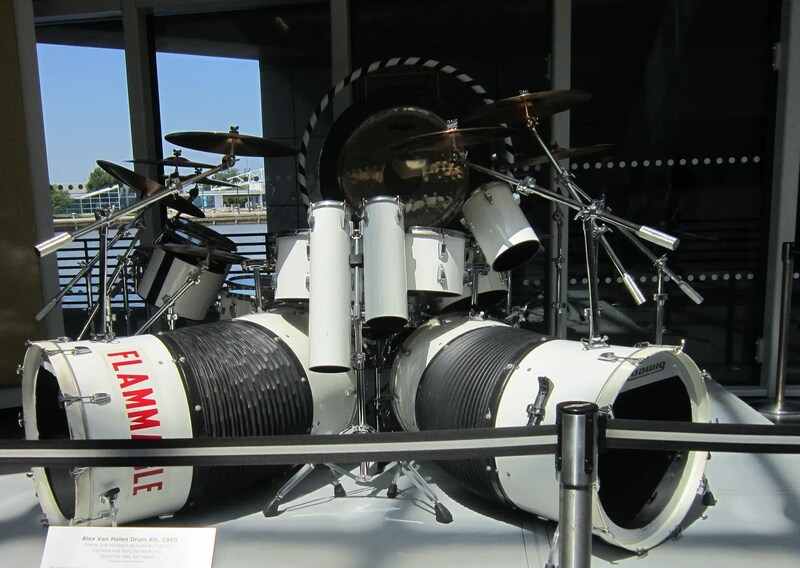 Gaze upon the drums of Alex Van Halen and let your mind drift back to the days when this kit thundered and rock beats were 100% guaranteed natural. Nice! For me this CD was a no-brainer upgrade — all my Pixies albums were on old cassettes. Finally I can listen to them in my car radio. 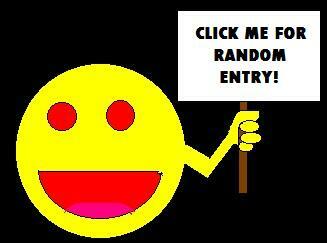 On “repeat”, even! We visited the Hall of Fame in August last year on our 2 week Great Lakes road trip. It was the Rolling Stone exhibit. I could have spent hours there, but not so the 9 year old. She was very excited to see the guitar from Coldplay’s Chris Martin, but more concerned about finding snacks. 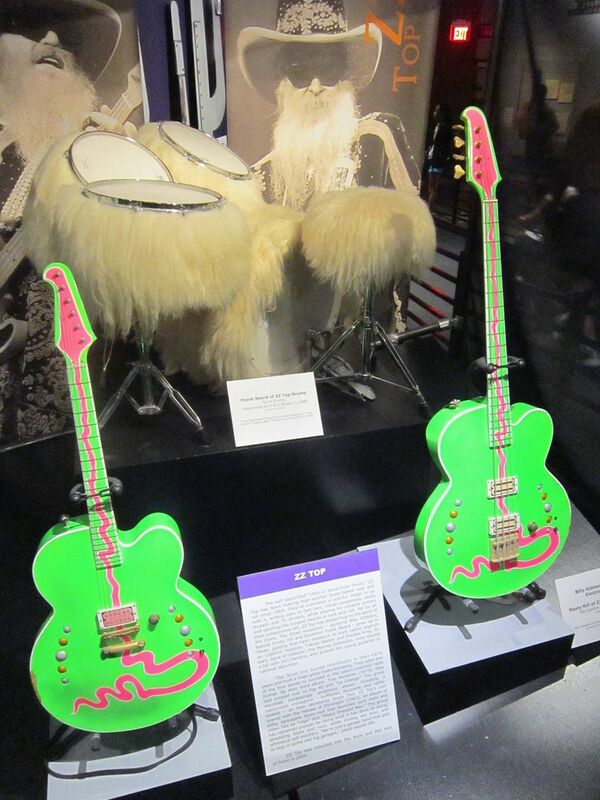 I enjoyed the roots of Rock and Roll exhibit – listening to original recordings was very cool. The audio exhibits were a blast to share with family, especially the kiosk where you pick a modern band you like, listen to a sample, and then listen to samples of the bands that influenced them. It was a fun object lesson, especially for my son, who’s still not fully versed on rock-music history. Brilliant idea for an exhibit.